Want to reduce your operation costs? Or maybe optimise your machine? Come along to the Farol Big Kit Showcase Events! 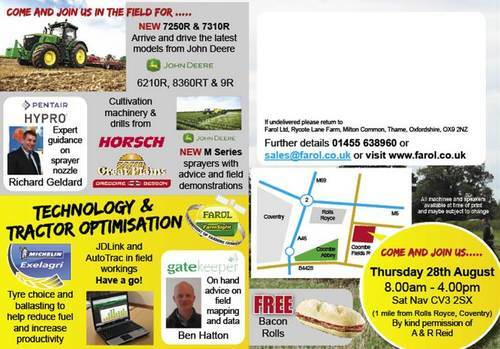 Michelin, Farol & John Deere will be running Tractor Optimisation Training comparing 2 John Deere 6190R tractors with 2 Simba DTX cultivators and showing the science behind machine set up. Topics will include ballasting, weights, tyre pressures and fuel saving tips.